Two pedestrian crosswalks provide visitors convenient access to Fallsview Casino Resort. The crosswalk over Fallsview Boulevard is enclosed and it connects the Casino to the Hilton Niagara Falls. There is a second pedestrian crosswalk overtop of Murray Street that provides easy access from the Skylon Tower area. 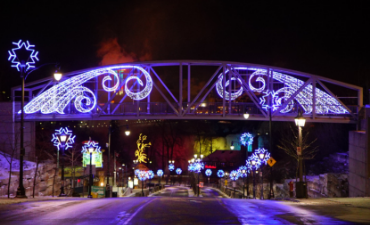 For the Ontario Power Winter Festival of Lights both crosswalks are illuminated with blue and white decorative lighting.